Some evidence suggests that pizza was consumed by prehistoric Italians. The concept took hold in ancient civilizations and became more common as time progressed. Many believe that the word “pizza” originated from the Latin word “pinsa,” which means flatbread. One legend holds that the now popular dish was created by Roman soldiers who grew fond of Jewish Matzo when occupying Palestine. Upon returning to Rome, they transformed the unleavened bread to include various toppings. However, archeological investigations in the region of Veneto uncovered what was thought to be a preserved form of pizza from the Bronze Age. The dish continued evolving and during the Middle Ages was common among the lazzaroni working poor of Naples. The people of the time developed a cuisine that was both inexpensive and easy to prepare. Flatbread topped with herbs, olive oil, tomatoes, cheese, garlic and anchovies was baked in outdoor ovens. Street vendors and local eateries also began offering the inexpensive meals, which the affluent deemed disgusting. The story goes that Queen Margherita visted Naples in 1889 and was tired of typical elaborate French cuisine and ventured to the Pizzeria Brandi. She soon favored a pizza topped with soft white mozzarella, fresh tomatoes and green basil. The dish became known as pizza Margherita. Despite winning royal approval, pizza remained a Naples tradition until the next century. 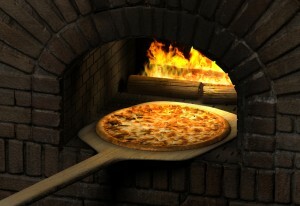 While many Neapolitans came to America and acquired factory jobs, pizza remained a home cooked meal. The Italian tradition was introduced to the rest of society when Gennaro Lombardi arrived on the shores of the United States in the early 1900s. In 1905, he established the first pizzeria in Manhattan, which still operates today. Soon, other Italian immigrants followed suit and pizza parlors opened in many other cities that spanned from Boston and Trenton to Chicago and St. Louis. Italian-Americans ventured from large cities to the suburbs and on to the east coast after WWII. The interest in pizza exploded with the onslaught of local pizza eateries. Soon Americanized versions emerged, which inspired the development of the many now famous chain restaurants. The meal equated with being “American” permeated various world countries. Today, gourmet pizza toppings include everything from Gouda cheese, barbecue chicken and smoked salmon. Locals and visitors alike enjoy the popular dish at a popular downtown pizza Las Vegas eatery.